This past week has been unseasonably warm—so warm that we were able to sleep outside in our “sukkah” (i.e., a tent). The nights were mild and beautiful, and we enjoyed a restful night of sleep in the fresh night air. Friday, the temperature dropped, and the wind increased. I figured my children would sleep inside where it was warm. But no, they wanted to camp out, and they convinced me to join them. We dressed warmly and took extra blankets outside. Like butterflies in cocoons, we snuggled inside sleeping bags with blankets piled on top. For a moment, I contemplated returning to my soft, warm bed but decided that since we had made the effort to drag extra blankets out to the tent, we would make the best of it. I abandoned the damp sleeping bag for the other side of the tent and again wrapped myself in blankets. Unlike the previous night’s calm air and relaxing sleep, the extreme windy conditions seemed to mock my attempts at sleeping as it whipped the protective tarp we had secured over the tent. My mind imagined the howling wind yanking the tent pegs and transporting us into another “world,” like Dorothy in the Wizard of Oz. Fortunately, our tent stayed intact and the kids got more sleep than I did. The kids are planning to sleep outside again tonight (even though it’s a little colder). And I might just join them. After all, it is Sukkot! Rosh HaShanah–a Joyful, Jewish New Year! “Blow the trumpet at the new moon, at the full moon, on our feast day. Rosh HaShanah (the Feast of Trumpets or Yom Teruah) is the first of the Jewish fall festivals. The Hebrew phrase “Rosh HaShanah” literally means “the head of the year” and is known as the Jewish New Year. Rosh HaShanah is described in Leviticus 23:23-25 where it tells the Israelites to rest and blow the trumpet or shofar (ram’s horn). Teruah is the Hebrew word for the blowing of the shofar (Numbers 29:1). This feast falls on the first day of Tishrei, the seventh month of the Jewish calendar. Rosh HaShanah holds future significance as a day of judgment since it is connected to the end of the harvest season and the beginning of the new season (Exodus 34:22). The days following Rosh HaShanah are intense days of repentance and forgiveness leading up to Yom Kippur. Blowing the shofar has significance in Scripture. The Israelites sounded shofars as a call to assembly, a command to move out, a call to war, in preparation for an announcement, a warning of judgment to come, a call to celebration and worship, or for the coronation of a new king, as well as new moons and feast times (Numbers 10:1-10). Varying sounds meant different things, and when blown correctly, the shofar could be heard at great distances. Blowing shofars was a reminder of God’s presence both during war and days of joy and also indicates judgment and the coming of the LORD (Joel 2:1). This feast does not merely point to the past, but also to the future. Isaiah foretells a time when Israel will be gathered back to their land at the sound of a “great trumpet” (Isaiah 27:13). The New Covenant prophecies Yeshua (Jesus) coming from heaven with the sound of the shofar at the rapture of His saints (1 Thessalonians 4:14-17; 1 Corinthians 15:51-52). The angels will also sound the shofar at His second coming (Matthew 24:31). Just like a new year marks new beginnings, this last trumpet will mark the beginning of the reign of Messiah (Revelation 11:15). Psalm 47:5 says that “God has ascended with a shout, the LORD, with the sound of a trumpet (shofar).” Yeshua was crucified for the atonement of sins on the very day of Passover; we eagerly await His imminent return which will be announced with the sound of a shofar. Like traditional New Year’s celebrations, Jewish people celebrate and commit for a better year, and one tradition is eating apples dipped in honey for the sweet New Year. Shannah Tova Umetuka! – Have a good and sweet year! Ah, summer! Longs days, warmer weather, and fresh fruits and vegetables from the garden. Each year, my family looks forward to eating fresh berries during June and July. You can use any fruit you have, but for Independence Day. we like to use red and black raspberries or strawberries and blueberries for a patriotic look. Preheat oven to 400. Melt butter in the baking pan. Combine milk, flour, sugar, and baking powder. Pour over butter. DO NOT STIR. Next add fruit on top. DO NOT STIR. Bake until crust has risen and is brown, about 30 minutes. Your daughter is growing so fast. How I wish you could see her! She is learning new words every day. She loves to look at pictures, and she now says “Da!” when I show her your picture. She keeps me busy as she likes to climb and gets into everything. I had this picture taken especially for you! Barbara is wearing her new dress she got for her first birthday. Fella Studio did an excellent job capturing her blue eyes. They do so remind me of you. Both of us are fine, but we miss you dearly. I tell little Barbara Ann all about you, and she can’t wait to meet her daddy. I know this letter is short, but I wanted you to get this picture as soon as possible. I will write more later. Lloyd smiled as he once again gazed at his only daughter. His wife was right. Barbara had his blue eyes, but she had his wife’s brunette hair. Oh, how Lloyd loved his beautiful brown‑eyed wife, and oh how he missed her! Would Barbara recognize him from his picture? How would she react when she saw her daddy for the first time? Would she reach out for him, or would she turn shyly away? Lloyd sighed as he carefully folded the letter and placed the picture back into his wallet. How he hated this war! He wanted to be back with his lovely wife and daughter.He wanted to be back with his lovely wife and daughter—a daughter who was growing up without him, a daughter he hadn’t even met. Hopefully, the war would soon be over, and then he would enjoy getting to know his daughter. But Lloyd never got that opportunity. 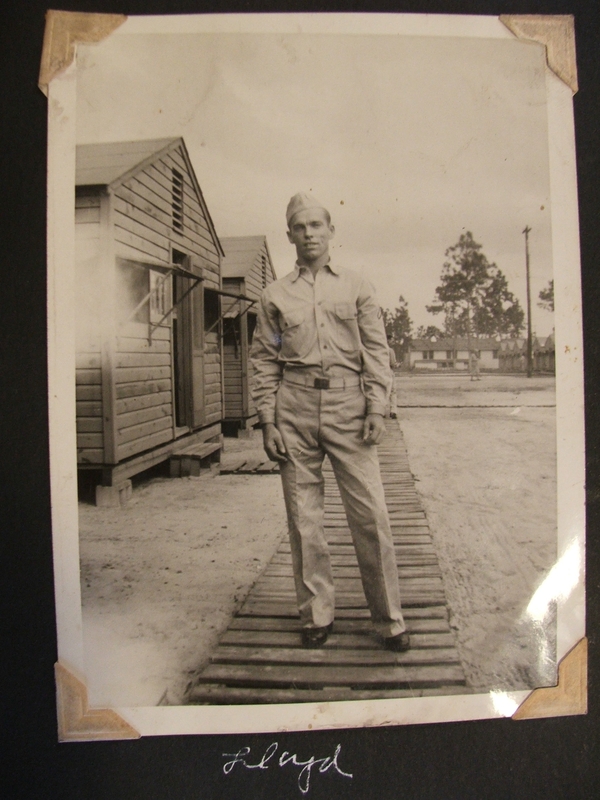 Lloyd Theodore Guessford died on June 7, 1944, during D‑Day operations in Normandy, France. He left behind a young wife and a daughter, not quite 17 months old. Connie tried to muffle her sobs as she rocked her young daughter who had finally fallen asleep. The young wife and mother struggled to be brave for her daughter’s sake. Yet, Barbara was perceptive beyond her young years. She knew something was wrong and she clung desperately to her mother while awake and resisted going to sleep. Connie let her mind wander back to the last time she had seen her beloved. She vividly remembered those final precious moments before Lloyd boarded the train that took him away forever. She had clung desperately to her husband as though she could prevent his leaving. Somehow, she had feared the war would take him away for more than just a couple years, despite his reassuring promises. “Connie, I’ll be back before you know it. Be brave for me‑‑and that little baby,” he said winking as he patted her slightly swollen abdomen. As much as she tried, Connie could not hold back the tears as she watched the train pull away. She was a brave young woman after that, and no one saw her cry. Only her damp pillowcase at night betrayed her emotions. Time passed, but that lingering fear that somehow the war would separate her from her beloved, never departed. Even before the confirmed report of her husband’s death, Connie knew that something dreadful had happened. Suddenly, her life was empty, except for little Barbara who gave Connie hope that life would go on. Barbara was her last living link to Lloyd, and somehow, she and Barbara would make it. This fictionalized true story was written in November 2000. I never had the privilege of meeting Lloyd Guessford, although I’ve seen pictures of him and Connie and have read the newspaper account of his death. Yet this man has become an important part of my life since I married his oldest grandson in 1991. Though dead, Lloyd lives on in his daughter Barbara, his two grandsons, and his three great‑grandsons and four great‑granddaughters. Without this man, whom I never met, I would not have a wonderful set of in‑laws, a terrific husband, two nieces, nor five precious children. 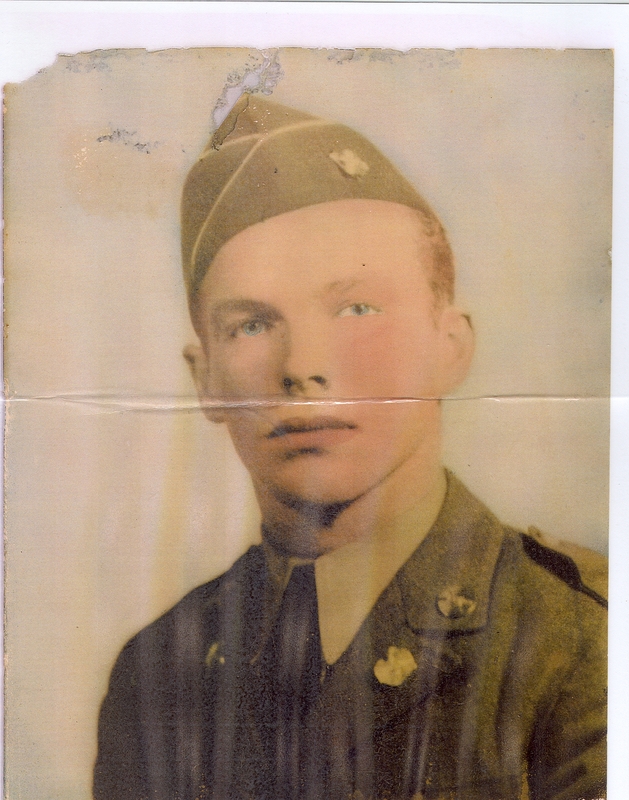 I am thankful for the many Lloyd Guessfords who fought to maintain this country’s freedom and for the many who willingly sacrificed their lives for that cause. You can read about my oldest son in the Army in Happy Birthday in Afghanistan..
Each year on the second Sunday in May, we honor mothers on Mother’s Day. While this day is special for many women, others dread that day. For the childless woman who wants children, Mother’s Day can be frustrating and a painful reminder of what is lacking in her life. No special flowers or Mother’s Day gift, just another uncomfortable service proclaiming God’s blessing of children. Parents nod and smile in agreement and wonder when she is going to start a family. “Don’t worry. Next year, you’ll be standing up with all the other mothers,” someone says. I am in pain. Someone just died. Who you say? Someone who never was. I am infertile. My period just came. I hurt so much. My body keeps reminding me I am incomplete, I don’t function properly. Why? Why? Why? Oh, my baby, why can’t you be? Some women, after years of infertility treatment, may conceive only to miscarry a baby. Life does not seem fair. While she desperately wants a baby, others intentionally abort their children. She would gladly adopt one of those babies as her own. Doesn’t anyone care for her pain? Although I have not struggled with infertility, I have experienced the hurt of miscarriage. I do not understand how you feel, but I know you hurt deeply. I care and wish I could alleviate your pain. I wish I could fill your empty arms. Please fill these empty hands. to fill my life with joy! One or two-I don’t care. to rest in You each day. I’ll trust You and obey. but have not love, I am like a noisy gong or a clanging cymbal. Yet I have not true love, I am nothing. True love is patient (even when dirty clothes are lying around). True love is kind and does not hurt the other’s feelings. True love does not envy or despair when disappointments abound and others prosper. Instead it seeks to make the other look good. Love is never too proud to admit failure or ask for help and understanding. Love neither manipulates nor seeks to change. Instead, love remains content with an imperfect partner. Love is forgiving and holds no grudges nor keeps track of the other’s failure. Love believes and seeks to protect the other. It patiently endures even through disappointments. Love hopes for better times and perseveres when all else fails. Romantic speeches and love songs will cease. But true love abides forever. When I was young, I had unrealistic expectations of love. Now, as a mature lover, I understand that a perfect marriage will never exist. Yet, I know that this present love only dimly reflects what my marriage can become. And it will continue to blossom with each passing year. One day I shall know you more fully than I do now. Faith, hope, and love abide forever. And truly the greatest of these three is love! Check out my poetic version of the love chapter, also from 1 Corinthians 13.